A business development manager is an expensive asset of the company. The crucial departments like sales and marketing are taken care by the business development managers. They hold the complete control upon these departments and are known to be responsible for all the happenings in these departments. Dealing with proposals of other clients and contracts are their main duties. Their marketing strategies and ideas make a huge difference in profits of the company. The BDM not only leads the team but is also liable to uplift the revenue of the company. BDM’S need to maintain healthy relationships with their business delegates and also keep pitching their business to the upcoming clients. The overall business exposure has to be given in a most appealing way by the BDM’s so that the clients step forward for their investment. A business development manager should be responsible for the present evaluation of the business. Thus, it’s vital to have a skilful and proficient business development manager in the company. Every company has its own team of business development executives and recruits a business development manager in order to lead the team of executives. Hiring a business development manager is a tedious task because the success of the company depends upon their potential and skill. Here are few profound ways to hire a good business manager. Communication is considered as the most important aspect in any business. Any person can convey information. But, the real difference lies in how the information is been conveyed. This difference comes with the most flawless and tricky words used in communication. The proficiency in language is as important as the cordiality in words. A business development manager should not only speak but also be able to get connected with others. Therefore, one of the major skill which is a must in every business development manager is communication. This is their asset and this is their magic wand, because it is their responsibility to build up a healthy relationship with the clients and customers so that the company maintains their financial sources intact. Hence, always select a business development manager who is not only proficient in his language but is also polite in his words. An introvert and a self-proud person can never help in maintaining a good team nor maintains a good relationship with the other team mates. The success of the company never depends on the work of an individual but on the whole as a team. It is essential that every individual of the company is a good team player who involves in all the team activities. The business development manager is the one who leads his other executives and makes the job get done. Being a leader, there are few qualities that every leader should possess. A leader should be the one who always help their team members to keep their spirits high. The leader should never be dim and boring because this also makes the others members feel the same. The BDM should be enthusiastic and high in spirit always. The team faces a lot of issues during work. The Business development manager should be able to solve the issues faced by the employees and be a good team player. Every employee will go through a phase where he or she is supposed to be the part of the team or lead the team of employees. But sometimes that team working thing doesn’t go well with some people or employees of the company. In the case of business development manager, it is not an option. The business development manager needs to handle their team in a smooth manner of work. A leader is not only the one who leads the team but the one who makes more number of leaders. Therefore, it is important that the manager should not only be good at managing the team but also be good at turning them into the best employees so that they can lead the team in the absence of the business development manager. Negotiating is not as easy as it sounds. A manager needs to be friendly with the other employees but at the same time make them complete the task within deadlines. A polite and a friendly manager cannot be good at negotiation. The politeness and friendliness should be maintained along with the skills of negotiation. Making an effort to negotiate is one of the major skills that every business development manager must have in their curriculum. Negotiation should not only limit to the team members but should also be extended to the clients who come up with their proposals. The business development manager is supposed to communicate with their business partners and negotiate their terms and conditions in favour of the company profit. Therefore, a business development manager without negotiation skill is nothing but a manager of the company who is not aware of the job description. The one who manages the resources available, can manage the world. The trick of succeeding lies in managing. Whenever the available resources are perfectly managed, then there would be no troubles arising. The two valuable resources that should be taken care of any manager are the time and money. Failing in managing these resources would bring a huge loss to the company. The sales and the marketing sections are the profit earning and profit losing sections. The BDM has to be involved in these two crucial sections of the company. The amount of time to be spent on these sections can never be measured. The BDM has to be able to manage the precious time available. The team meetings, client meetings, interactions with the other departments should all be managed within the given time limits. There will always be pressure from the clients regarding product delivery and exchange. But all this pressure has to be dealt just with a smile on the face. Everyday a new problem starts arising within the team. Due to troubles faced, the BDM cannot lose patience upon the team members just because of the external obstacles. Whenever a BDM becomes harsh to the employees, the relation between the employees and the manager tends to decline naturally which even shows an impact on the output of the company. The other skill which has to be managed is money. Money is the only way to determine the accomplishments of a company. Therefore, the business development manager should also be able to increase the sales and proposals by negotiating perfectly. Deals and proposals are daily tasks of the business development managers. A BDM should not only make the deal work but also negotiate with the amount of money spent or received. The business development manager is supposed to have an amazing project management skill. Therefore, as per the requirement even project management skill is also one of the strong skills of the business development manager of the company. Researches and developments are the future objectives of the company. A business development manager should not only able to tackle the present and also should be able to visualize the future market and also be able to understand, where they stand in future. The strategy behind any successful product in the market is due to the vision of the company and their business development managers. The companies have made the thought process for the people and have recognized the problems that people will likely face in the future. The results for such a visionary are pages of successful stories in the present. Therefore research and development team for any business is an investment made for the future. Problems which are going to be faced in the future should be able to be visualized in the present. The strategic thinking of the business development manager plays an important role. The BDM has to take care of the necessary research details required for the project. The business development manager is only responsible for the development of project as per their work description provided. Therefore, research and development is a strategic level of the company where the business development manager takes all the responsibility of handling it to the end of the project. Skills are necessary for any employee to be an ideal employee. The proficiency in the knowledge of employees is always beneficial to the company. Good and sound knowledge of technological skill is an asset of employee. These skills are the one which are related to the digital, computers and other technical stuffs. According to the designation of the business development manager, he is supposed to handle all sorts of strategies and publishing part of the company. A business development manager cannot raise queries for simple things working with a document or an excel sheet. The knowledge which is required to handle the daily tasks should be acquired by a business development manager. The BDM should be able to understand computer advancement better as it is their responsibility to take the company’s potential to its higher end. Business development managers are expected to be smart and sharp most of the times. They deal with a lot of issues and cannot be expected to be dumb and ignorant at all the times. They are expected to provide solutions for the troubles been faced by employees. Marketing ideas and strategies are also been expected from them. Therefore, having an impeccable intelligence is one of the trade points of any business person. And when it comes to the business development manager, it is one of the must things to maintain in their resume. Therefore, without business intelligence a business development manager is a common man in the middle of the higher political authorities. Therefore, business intelligence brings in strategy to take the project to its ultimate level. While listing out all the qualities of the higher performing business development manager, one can definitely list out all the below stated points considered to be one of the major highlights of the business development manager. A business development manager is well known for their strategies regarding execution of their plan of action. Usually, some people think that business development manager needs to generate leads to meet the sales at the end of the financial year. Therefore, it is necessary to create a margin between these elements as per their product and business knowledge. Moreover, high level of knowledge over the business and its product can make their business go smoothly as per their plan. Marketing certain product lines or marketing certain business are two different things, but a person who understands business along with market dynamics can pull off the assigned post very smartly. Therefore, the business development manager is supposed to understand the marketing dynamics better than the rest of the employees of the company. Moreover, understanding or better understanding about the market dynamics adds in advantage for the company and their business development. If a business development manager is supposed to understand the market dynamics better, then it is his duty to identify all the necessary social media exposure for the company and their products. Therefore, it is necessary to create a differentiation between social media and market dynamics, as these two are similar and connected to each other in its own way. Moreover, creating differentiation brings in advancement of the company profits naturally. The business development manager is a person who handles and is responsible for all the business development executives in their team or project. And that is why as per the rest of the business development executives, a business development manager is entitled to the salary along with the additional commission, bonus and profit sharing which is allotted for the work and efforts put on reaching the company targets. Which can be approximately $131,000 worth. 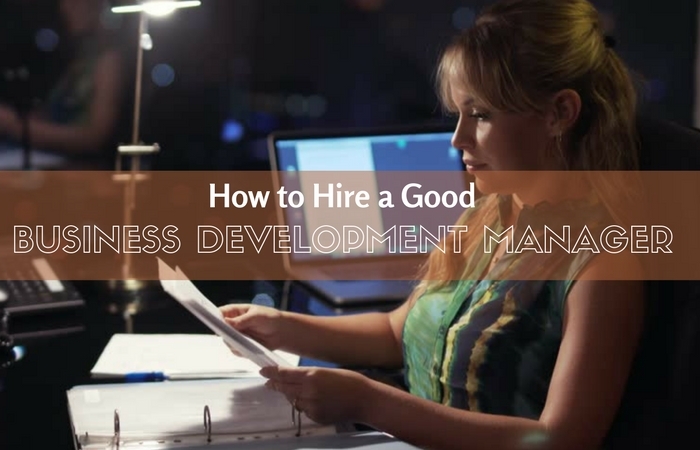 Finally, the bottom line is that at the end of this discussion over hiring a good business development manager, one need to understand the basic details about the skills and qualities required to be a good business development manager. Therefore, anyone interested to know more about the business development manager, can read and follow all the points mentioned above to get hired as one of the deserving business development managers.